Some projections for the next 5 years during which the EV vs. petrol battle will be played out, as well as the grid storage transition. In my Peak Everything slides I picked on lithium as a particularly interesting metal, primarily because of its limited cheap source, its expected huge increase in consumption leading to a leap in cost of extraction to spodumene rock. It is between 50% and 100% more expensive to get lithium from rock than brine, however since there is no lithium exchange- sales are long term and murky- significant differences in extraction cost exist simultaneously. Lithium is not actually the most expensive component of a lithium battery strangely ( its cobalt in most current ones) but the switch over from cheap sources to expensive sources is interesting. The above report is current projections for demand. I found the most interesting slide to be this one. From other graphs lithium use for batteries (about 1/3 of total consumption) is now larger than lithium use for glass and ceramics. 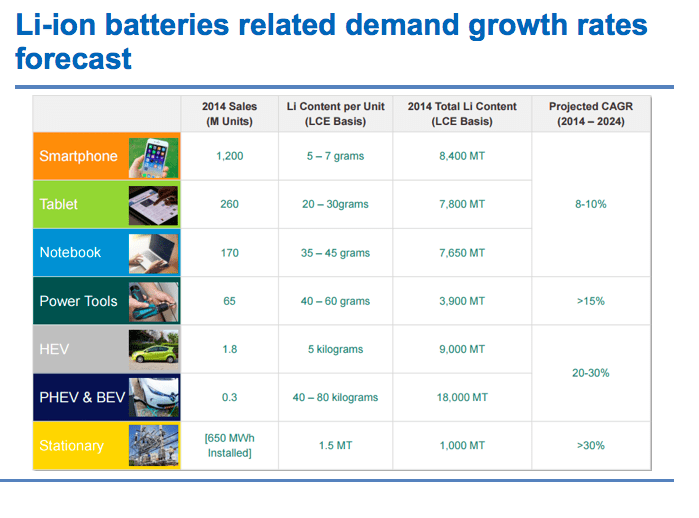 An interesting projection is based on the learning curve for batteries for EV’s. If the 2007-2014 rate continues, they should meet parity with petrol driven cars target around 2021- at which time batteries will not be the major cost element of an EV. Of course this depends on the cost of oil which is frankly unknowable over the range 20$ to 120$! The appendix contains a couple of recent cheaper battery claims. One of these (if it happens) would reduce battery costs for EV’s to half the rule of thumb cost at which EV’s compete with petrol.